Virginia Willis is a native Georgian and chef to the stars; most importantly, she is a true Southern lady. Her cook book Bon Appetit, Y’all is a practical manual for an aspiring cook taking the reader through the ins-and-outs of a kitchen South of the Mason Dixon line. Y’all may recall a work entitled The French Chef Cookbook by Julia Childs. Willis trained in the French kitchens at L’Academie de Cuisine and Ecole de Cuisine LaVarenne, not to mention she’s a UGA Bulldog (as can be seen in her red & black portrait). She served as Kitchen Director for Martha Stewart Living Television where she supervised the food segments for the Emmy-award winning television show. Willis has cooked for everyone from Miss Martha to President Clinton, Aretha Franklin, and even Julia Child herself. As Executive Producer for Epicurious on The Discovery Channel, she traveled the world taping fantastic stories about food – from harvesting capers in the shadow of a smoldering volcano to making authentic mustard in Dijon. 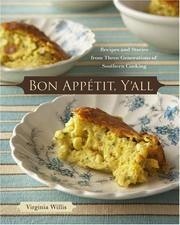 But being a native Southerner, Willis knows there is no place like home, so she parlayed her knowledge into the acclaimed cookbook, Bon Appetit, Y’all! Recipes and Stories from Three Generations of Southern Cooking (Ten Speed Press, 2008). Throughout her book, Willis takes the reader from her Meme & Dede’s farm in Macon County to the shores of the Mediterranean, the banks of Italy, the vineyards of France and then back home to the South. It’s easy for the reader to imagine picking blackberries, peaches and fresh corn with her family, baking biscuits with her grandmother, and frying chicken with her mama. The gourmet chef is a huge proponent of shopping local and advocates using sustainable ingredients in her recipes. For more information on this great lady and her foodie art, check out her website or follow her on Twitter. We’re looking forward to testing out some of Miss Virginia’s recipes this year on PrettySouthern.com. Stay tuned to see our attempt at her culinary delights. Has anyone out there read Bon Appetit, Y’all!? If so, what are some of your favorite dishes? I’ve been eyeing her book for a while now! And I cannot wait to purchase and try some recipes! I love that she blends French cuisine with traditional Southern foods. And I love that she worked for the one and only Martha Stewart!! !